NAZARENE ISRAEL FAITH, TORAH TREASURE TROVE - Welcome To PART 2 Of ... FAST AND PRAY THE BIBLE WAY !! This Is Part 2 ... OF A 3 PART SERIES ON FASTING AND PRAYER ... PART 1 SHARES DENIS`S OWN AMAZING INTRODUCTION TO A LIFE OF FASTING & PRAYER. PART 2 SHARES THE AWESOME AND ABSOLUTELY STAGGERING TESTIMONY OF YOUNG KEN CANTRELL WHICH HAD SUCH A LIFE-CHANGING EFFECT ON DENIS. IN PART 3... YOU WILL FIND MANY PERSONAL TIPS, HELPS AND EXPERIENCES FROM DENIS` OWN LIFE, BASED ON OVER 40 YEARS OF FASTING AND PRAYER FROM SHORT FASTS OF UP TO 10 DAYS, TO FASTS OF 40 DAYS AND MORE ; FASTING TEACHINGS FROM THE MINISTRY OF REV. FRANKLIN HALL, AUTHOR OF MANY BOOKS ON FASTINGS, ARE INCLUDED WHICH CAN HELP YOU AS YOU SEEK TO SERVE YAHWEH IN FASTINGS AND PRAYER. PART 2 ... SHARES THE INCREDIBLY AMAZING TESTIMONY OF THE PRESERVATION FROM DEATH OF SAILOR BOY KEN CANTRELL OF THE U.S.A. THE MIRACLE OF THE CENTURY THAT MADE HEADLINE NEWS WORLD - WIDE !!! M I R A C L E A T S E A Above : Ken Cantrell And The USS Lake Champlain Flames Around My Body For 35 Minutes ...The story you are about to read is probably the most amazing you will ever be privileged to encounter! Young American sailor-boy, Ken Cantrell escapes alive from the midst of a burning hell caused by an explosion aboard the U.S.S. Lake Champlain Aircraft Carrier. A modern-day Miracle of preservation akin to that of Daniel`s 3 friends, Shadrach, Meshach and Abed-Nego in the burning fiery-furnace of Nevuchadnetzar, Melech of Bavel.!! Your heart will thrill as you discover the awesome power of Elohim in operation as He protects His own. "3.000 WITNESSES WERE HELD SPELL-BOUND BY WHAT SEEMED IMPOSSIBLE: THAT ANY PERSON COULD SURVIVE FROM THAT EXPLOSION" YESHAYAHU CH.43:2 "WHEN YOU PASS THROUGH THE WATERS, I WILL BE WITH YOU: AND THROUGH THE RIVERS, THEY SHALL NOT OVERFLOW YOU: WHEN YOU WALK THROUGH THE FIRE, YOU SHALL NOT BE BURNED: NEITHER SHALL THE FLAME KINDLE UPON YOU". The Aircraft Carrier, the USS Lake Champlain, on which Ken Cantrell was serving was enroute to Italy going 40 knots per hour when the explosion occurred in the Mediterranean Sea off the coast of Gibraltar. At 11:03am on August 7, 1953 at the time of the explosion, Ken Cantrell was in the Catapult Room of the largest Aircraft Carrier in the U.S. Navy. At the time a crew of 16 men were sending off planes every 2½ minutes. Fifteen of the crew were killed instantly, but the 16th crew member, Ken Cantrell, survived. The explosion caused an inferno of death, but Ken Cantrell was protected by the power of the Holy Ghost: “God told me that I should not be afraid, but to open the door and go out. I went in and out, and I carried the burning bodies one by one out of the ‘melting death oven’, while the flesh fell from their bones.” This took approximately 35 minutes. “We were on our way to Italy facing 40 knot winds when it happened. At that time, the power of Jesus and His Holy Ghost (ACTS 1:8) were upon me so strongly that this supernatural ‘Holy Ghost Power’ kept me from being scared or from suffering any injury or burns.” Ken Cantrell, now an ordained Baptist Minister of the Besorah of Yahshua HaMoshiach, tells you his Story.......The Beginning “I was born on June 15, 1932, in Huntsville, Alabama. My father was a night-club owner. The name of the night-club was ‘Bloody Bucket’. It was the most notorious, toughest and bloodiest night-club in the entire state of Alabama. I remember that in one week, 17 people were killed inside the club and in front of it. Sometimes in the gambling world hundreds of thousands of dollars changed hands in a single night. I saw my Dad win as much as $80,000 in a single hour. Before I was 16 years of age, I had been arrested 117 times. When I was only 11, I could whip any boy up to 18 years of age in our town. I was as deep a sinner as anyone could have been. It was in this kind of environment in Huntsville, Alabama, that I was raised, without knowing the Lord Jesus Christ. At the age of 18, a great transformation came over my entire life. My grandfather was a Baptist minister. Although I was one of the worst sinners, I had respect for my grandfather and the Baptist church. I often wondered what it would be like to be a Baptist minister. I gave my heart to the Lord at 18, and I gave up my old ways. I took my Havana cigars out of one pocket and my Tampa cigarettes out of the other pocket. I then took out and threw away my loaded dice from yet another pocket and removed my marked playing cards from still another pocket. I meant business when I accepted the Lord as my Savior. I was determined to serve and follow Him all the way. `WAS GIVEN THE TRUTH IN A BOOK THAT SAVED MY LIFE` When I was stationed in San Diego, after I enlisted in the U.S. Navy, a Brother Ratan invited me on the street to `Mother Lane`s Hospitality Home` for the Service Men. Although I was on my way to a Baptist Church, Brother Ratan persuaded me to come to his Service-Men`s Centre. A minister, the Rev. Franklin Hall, through his brother the Rev. Del Hall, had generously donated without charge, a large quantity of his books for gifts to the Service-Men , to the `Hospitality Centre`. I never knew this at the time I attended `Mother Lane`s Centre.At this Centre, Brother Ratan gave me Brother Hall`s book entitled `Because of your Unbelief`, writing my name on the cover, he asked me to read it. He told me that this would enable me to go deeper with the Lord. When I started to read it and saw that it dealt with Fastings of all lengths I decided it was not for me. I thought the author was a little bit off. I however, kept the book with me. On the Aircraft Carrier `Lake Champlain` I tried to read it once again. I then threw it away. Since my name was on it, someone picked it from the trash and brought it back to me. I tore off the cover where my name was on it and tore it up into fine pieces and tossed it into the ocean. I then threw the book into the garbage can. I figured that in the garbage can it would be gone for good and that no one would find it there. Even if they would find it, my name would not be on it. My Commanding Officer loooked in the garbage can and picked it up.What business would a Commanding Officer have looking in a garbage can? He brought it to me and asked if it was my book. I was embarrassed when I informed him that it was mine. For some reason or other, he asked me to be sure to read it first and then if I wished to discard it, i could do so. To this day I did not understand why my Commanding Officer ever looked into a garbage can excepting it to be the Lord who led him to do this. I again tried to get rid of it. Someone found it and placed it under my pillow after bringing it back. It seemed that i just could not get rid of the book. Had I known and realized the vast and tremendous Truth that was contained in the volume - and Truth of such magnitude that because of it, my life was truly miraculously saved, I would have treasured the book as my own soul. The book being returned to me so many times made it seem as though the Lord desired me to really study and read through it. I decided to read it carefully through. Although I had been a Baptist Preacher, I began feeling the Anointing in the pages of Bro. Hall`s book. The more I read, the more interested I became. I decided to try out the Fast. The book was all about Fasting and Faith. It told how a person could go into the long Fasts as well as the short ones. I decided to Fast for 21 days. Below : THE REV. FRANKLIN HALL (Author) Fasting for Power with God After reading Franklin Hall’s book about fasting, “Because of Your Unbelief”, I started a 21-day fast (water only). After 3 days, hunger left my body and I felt the presence of the Lord on my body in a way I had never felt before. The Lord gave me the verse in LUKE 10:19, and showed me that nothing would hurt me: "Behold, I give unto you power to tread on serpents and scorpions, and over all the power of the enemy: and nothing shall by any means hurt you." On the tenth day, I felt a warm healing power come over my whole body. Daily, this ‘covering power’ over my body grew stronger and stronger. I had the same experience as the 120 disciples in the upper chamber, in ACTS 2:3: "And there appeared unto them cloven tongues like as of fire, and it sat upon each of them." These tongues of fire also sat upon me. In LUKE 24:49, Jesus said that this would happen. The Scripture in PSALM 118:17 also came to my mind: "I shall not die, but live, and declare the works of the LORD." I later learnt that it was the baptism of the Holy Ghost on my body which preserved and saved me from death and destruction. After the 10th day of fasting, several of the boys remarked that they saw a light around my body. They asked me if I had some type of luminous clothing on. Anyway, I felt more wonderful about my salvation than I had ever felt. I felt that I had a lot more of God’s power within me. I also had a greater love and burden for my fellow man. Day by day on my 21 day Fast I could feel this `Holy Ghost` protection increasing all over my body. it had a pleasant, warm feeling to it and kept getting warmer on my body, especially on the 15th and 16th days. The night before the explosion it was so strong on my body I could hardly sleep. My mind was highly alert, active, and I felt stronger in my body than I had ever felt in my life. The Scripture (Psalm 118:17) kept coming to my mind, "I shall not die, but live, and declare the works of the Lord" Death Let Loose “At 10.30am, on the 17th day of my 21 day “consecration fast”, I was alone in the Catapult Room, where I was engrossed in Brother Franklin Hall’s book, “Because of Your Unbelief”. I was alone, because I was fasting. All of the rest of the crew were out to get candy bars, coffee, cigarettes, refreshments, etc. The events proceeded as follows: 10:55 am – The crew began coming back to the room. 11:00 am – Many of the boys were back in the room. 11:02 am -Every one of the 16 crew were now back in the room and we were ready for our duties11:03 am -Suddenly we heard a noise. Someone above us had made a blunder. An Aircraft came in wrong, damaging the Area near our room. This ignited a fire. High Grade Aviation Gasoline was near the accident and was pouring into our room. It soon ignited and became a huge sheet of billowing flames. Immediately the whole Deck was ablaze with flames all over the Catapult Room. If many of the boys, who had just returned a few seconds earlier, had stayed away for just a moment longer, they would not have been engulfed in the ‘flames of death’. They would not have been in the room. Horror came over their faces. Some tried to run. Many were screaming: “Fire! Fire!” I also yelled out: “Fire!” Huge billows of rolling, raging flames were rushing towards everyone. It moved quickly. We had no time for anything. Great flames engulfed each and everyone of us including myself. It was like lightning. With horror I saw all 15 of my Crew Mates swallowed up in sudden death. Joe and Don were the furthest away from the only door in the room when the explosion occurred and Don fell to the floor with Joe Carnes. Joe Carnes was my best friend. He was heavy-set, crew cut and came from Louisville, Kentucky. When in Norfolk, Virginia, I tried to get him to go to church with me. I talked to him about Jesus. He would not come to church and refused to accept Christ. Joe was sitting next to me at the time of the explosion. He began shrinking in the flames. His head, shrunken so small appeared as a mummy dwarf - others likewise, as I watched their bodies bake to a crisp. I reached over to where Joe had been sitting and placed him on my left arm and partly on my shoulder but his flesh fell from his bones as I held him in my arms.It was not long before I could hear the frying of the flesh from the bodies of my buddies. It just did not seem possible that I could be alive in the Furnace of Fire and my buddies being killed. As the flames of death engulfed my buddies one by one, it seemed that I had supernatural eyesight when I could look through the Flames and see all 15 of my buddies go down in the flames. In front of my eyes I saw all 15 of the crewmen die. I did not understand the nature of the power with which my beloved Jesus had equipped my body. First of all, it was almost unbelievable that the fire was real, because I could not feel the heat at all, although the flames totally covered me from every corner. I therefore did not understand how the fire could injure my colleagues to such an extent that they burned in front of my eyes. But Jesus was so close, and I felt the power of the Holy Spirit so strongly, that this supernatural power of the Holy Spirit prevented me from being scared or injured.” I then went to my other mate, Don Hatcher. He was a dark-haired young man from Kansas City, Missouri. Don was trained and worked in electronics, and he had assisted me with the P.A. system. I really liked him, but I had not been successful in turning him around to Jesus. I tried and tried, but in vain. I believe that if he had been saved, God would have somehow rescued him from the flames. He did not want to die, and he screamed when the fiery ‘arms of death’ came towards him. Don tried in vain to escape from the deadly fire’s reach, but the flames overcame him. The flames filled the whole of the 10-15 metre long room. If this had not been a supernatural event, I should not have been able to get away. There was also another sailor to whom I was very close. 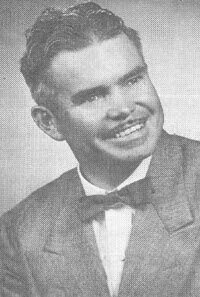 He was a red-haired young man, Elbert Schaeffer, from Washington State. He had a quick temper and was always looking for a fight. He sometimes fought with the other guys, and he also fought a lot with me before I became a Christian. I spoke with Elbert of how Jesus could take away his lust for fighting, but he had shrugged this off. He even tried to fight the flames by thrashing wildly with his arms, but to no avail. Thomas Moore was a man of average build whom I tried to win for Jesus. He answered in passing that there was still time for him to make up his mind. There was a huge wall of this fire at least 30 feet thick. I felt no pain. I was walking back and forth in the flames hardly realizing what to do, not feeling any discomfort or even heat of the fire in any manner. My first thought was not for my own safety, but for my buddies. I still had Brother Hall`s book with me. I laid it down in the fire. It seemed that the Truth of the Lord Jesus in the volume and the way and manner that I was practicing it had brought the Power of the Lord Jesus upon my body that I could not be hurt. While in the fire I tried to pick up the bodies of some of my mates to see if there was any life in them. As I grabbed them, tugging at them, their baked and cooked flesh just fell off their bones. I tried picking up several in this way. I was in the flames for 35 minutes. The floor was getting red hot. The dog wrench over near the hatchway was also red hot. I was struggling with my friend Joe’s corpse. I had carried him back and forth a couple of times in the room of fire. Now as I was facing the hatch, the Voice of the Lord came forth and told me, "Go forward to the red hot hatchway. Be not afraid. Grab the wrench, open the door and walk out." I got closer to the door and hesitated right in the Flaming Inferno. Although flames were around me I did not dare to touch the glowing red hot door. Again the Lord said, "Be not afraid, I am with you, you shall not die, open the door and walk out." I still held the corpse of Joe. I picked up the red hot dog wrench with my right bare hand and used it to open the hatch. I walked out, much to the amazement and bewilderment of the Officers, Chaplain and spectators, and laid down the body of my buddy Joe. I then turned to go back in for the bodies of the rest of my buddies. My Officers ordered me not to but I disobeyed and returned against orders and retrieved, one by one, the corpses of my buddies and brought them out and laid them down. The skulls were shrunken to about one half their size. This was true for each and every one of them. The extreme heat on the bodies and bringing them out into the cool air caused some of their eyeballs to pop out. When I carried each body from the room, they were unidentifiable. The heads and torsos were burnt so far beyond any normal expectation, that you could not even recognize them as human beings. A sailor tried to follow me into the Catapult Room but his feet were burnt off and he was left with stumps. I was unhurt. My clothes were not even scorched and no smell of smoke. I then remembered that I had left my book in the Fire. I returned for it and retrieved it. The book was untouched and entirely intact just as I had laid it. The cover was off because at first I did not like the book and I had thrown the cover overboard. Right on each side of the book, "Because of your Unbelief" there were ashes. They were all around it. All other books were burned to ashes. The Truth that God had led Brother Hall to put into the book was not burned. The Chaplain of the Ship who had previously refused to allow me to have Prayer Meetings in the Ship almost knelt down at my feet, telling me I could have Prayer Meetings any time at any place. God had shown how He still protects all who truly follow Him. Below : U.S.S. 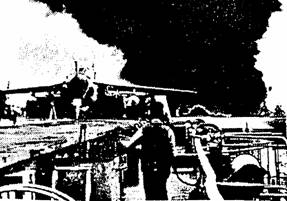 LAKE CHAMPLAIN...AIRCRAFT CARRIER AT TIME OF EXPLOSION.Note in the picture how high the flames were and how the smoke spread up through the flight deck. It took seven months to repair the damage to the Catapult Room. The metal, control valves and maneuver panel were totally melted.Everything had to be replaced. _______________- He walked through fire for 35 long minutes Three thousand sailors were witnesses to the explosion and to the Holy Ghost `superman’ who walked through a Wall of Fire at least 30 feet thick for 35 minutes and was completely unhurt, with no smell of smoke on his clothes. Below : USS LAKE CHAMPLAIN TESTIMONY OF 2 EYE-WITNESSES "In the mouths of 2 or 3 witnesses every word may be established" Mattityahu ch. 18:16 "It is also written in your Torah that the Testimony of 2 men is true" Yochanan ch.8:17 `Miracle-Light` - `A Coat of Power` - Lt. Jim Brown, U.S.N. Rey., Spokane, Wash., reported: “I was the First Officer when the accident happened and I saw Ken Cantrell walk through the flames several times. I saw Ken go in and out of the room. He carried out 15 bodies, the whole crew that had been working with him. They were all dead and impossible to recognize. They looked like roasted meat. I tried to stop Ken when he was going in and out of the ‘melting oven’. I tried to stop him outside the door but came too close to the entrance of the room and got burned and had to be treated. The fire did not have any effect on Cantrell’s body. He was like a superman, though he became exhausted in his exertion of carrying out the bodies. I saw the Doctor examine Cantrell after the fire was put out. There was not the slightest sore on his body. Cantrell was asked by the Doctor to come to the sick bay for observation. I saw with my own eyes a sick boy stand up healed when Cantrell’s shadow got close to him. This got me thinking about Peter’s shadow which healed the sick, as related in the Acts of the Apostles.”__________________________________________________ Bill Harris, Portsmouth, Vermont, reported: "I was stationed with Ken Cantrell on the USS Lake Champlain, and was one of many witnesses who saw how Cantrell went through the fire, picking up the dead bodies on which the flesh was so burnt that it fell from the bones. All 15 crewmen died in the fire. “I had watch duty from 8:00pm until midnight in the part of the ship where Cantrell was living. It was approximately 11:00pm on the 6th of August, 1953 - the night before the explosion. Cantrell didn't take part in any meals. I went over to him to say that it was high time to switch off the light. He said to me that he didn't have a light on. I just could not believe it. I went closer to the cabin in which he slept, and could hardly believe what I saw. I saw how light came out of Cantrell's body. I had read about light shining from a man in the Bible, a prophet that had fasted for 40 days. I know that it was this supernatural preserving fire of God that saved Cantrell from being burnt or injured when the flames came over him." 12 OTHER SAILORS WHO WITNESSED FIRE ON U.S.S. LAKE CHAMPLAIN THEIR ABBREVIATED COMMENTS : WILLIAM EDWIN BARTLETT (SERVED 1953) - "WORST REMEMBERED FIRE ON FLIGHT DECK IN 1953" NEALE E. BENNETT (SERVED APRIL 1953 - SEPT. 1953) "FLIGHT DECK FIRE" HUBERT K. BRITTAIN (SERVED 1952 – 1954) "FIRE ON FLIGHT DECK". "REV. ALLEN CLARK BUDD (SERVED 1953) " FLIGHT DECK CRASH, INJURIES AND DEATH" VINCENT J. CANGIAMILA (SERVED 1953-54 )… "FIRE ON FLIGHT DECK" EARL ROBERT ELKINS…. (SERVED APRIL 1953 – NOVEMBER 1953) … "TERRIBLE FIRE ON FLIGHT DECK" CLYDE L. EMBREY (SERVED 1952 – 54) … "FIRE ON FLIGHT DECK" THOMAS W. FIFE (SERVED 1953 – 1954) … "DEATH OF SHIPMATES" STANLEY W. IMMICH (SERVED 1952 – 1954) … "SOME CLOSE FRIENDS AND NOT SO CLOSE FRIENDS GETTING KILLED ON FLIGHT DECK". DAN C. MONROE (SERVED 1952 – 55) … "FIRE – AIRCRAFT" GLENN L. ROTHE (SERVED 1952 – 54) … "FLIGHT DECK FIRE 1953" “SAILORS IN THE SKY” by JACK SAUTER : SAILOR/AUTHOR (SERVED MARCH 1953 – DECEMBER 1953 ____________________ NOW THAT YOU HAVE READ THE AWESOME AND EXCITING EXPERIENCE OF BRO. KEN CANTRELL, WHY NOT GO TO PART 3 OF THIS SERIES ON ...`FAST AND PRAY THE BIBLE WAY` AND READ THE INSPIRING TESTIMONIES AND TEACHINGS ON CONSECRATED FASTS OF UP TO 3 DAYS, 14, 21, AND 40 DAYS!! !AND OF HOW TO SAFELY ENTER, OUTWORK AND CONCLUDE CONSECRATED FASTS ! !MUCH OF THE TEACHINGS IN PART 3 ARE DRAWN FROM THE TEACHING MINISTRY OF BROTHER HALL, WHOSE BOOKS ON THE SUBJECT OF THE CONSECRATED FAST ARE SECOND TO NONE!! YOUR HEART AND SOUL WILL SURELY THRILL WITH EXCITMENT AND ANTICIPATION AND PRAISE TO YAHWEH AS YOU READ OF HOW YOU CAN ENTER A CONSECRATED FAST THAT WILL REVOLUTIONISE, ANOINT, STRENGTHEN AND BLESS YOUR LIFE AND MINISTRY FOR YWHW. YOU TOO, AS YOU READ, IMBIBE AND OUTWORK THE TEACHINGS IN PART 3 , CAN EXPERIENCE SUCH A REVOLUTIONISING LIFE-CHANGING EXPERIENCE THAT WILL FOREVER DEEPEN, STRENGTHEN, ENVELOPE AND PERMEATE YOUR WHOLE BEING THAT YOU TRULY WILL NEVER BE THE SAME AGAIN. MAY YAHWEH BE PRAISED!! ________________________________________________ America, The Beautiful: Lyrics by Katharine Lee Bates - 1913 O beautiful for spacious skies,For amber waves of grain,For purple mountain majestiesAbove the fruited plain!America! America! God shed His grace on thee,And crown thy good with brotherhoodFrom sea to shining sea!O beautiful for pilgrim feet,Whose stern impassion'd stressA thoroughfare for freedom beatAcross the wilderness!America! America! God mend thine ev'ry flaw,Confirm thy soul in self-control,Thy liberty in law!O beautiful for heroes proved In liberating strife,Who more than self their country loved,And mercy more than life!America! America! May God thy gold refineTill all success be nobleness,And ev'ry gain divine!O Beautiful for patriot dreamThat sees beyond the yearsThine alabaster cities gleam,Undimmed by human tears!America! America! God shed His grace on thee,And crown thy good with brotherhoodFrom sea to shining sea! PART 1 SHARES DENIS`S OWN AMAZING INTRODUCTION TO A LIFE OF FASTING & PRAYER. PART 2 SHARES THE AWESOME AND ABSOLUTELY STAGGERING TESTIMONY OF YOUNG KEN CANTRELL WHICH HAD SUCH A LIFE-CHANGING EFFECT ON DENIS. FASTING TEACHINGS FROM THE MINISTRY OF REV. FRANKLIN HALL, AUTHOR OF MANY BOOKS ON FASTINGS, ARE INCLUDED WHICH CAN HELP YOU AS YOU SEEK TO SERVE YAHWEH IN FASTINGS AND PRAYER. PART 2 ... SHARES THE INCREDIBLY AMAZING TESTIMONY OF THE PRESERVATION FROM DEATH OF SAILOR BOY KEN CANTRELL OF THE U.S.A. The story you are about to read is probably the most amazing you will ever be privileged to encounter! Young American sailor-boy, Ken Cantrell escapes alive from the midst of a burning hell caused by an explosion aboard the U.S.S. Lake Champlain Aircraft Carrier. A modern-day Miracle of preservation akin to that of Daniel`s 3 friends, Shadrach, Meshach and Abed-Nego in the burning fiery-furnace of Nevuchadnetzar, Melech of Bavel.!! Your heart will thrill as you discover the awesome power of Elohim in operation as He protects His own. "3.000 WITNESSES WERE HELD SPELL-BOUND BY WHAT SEEMED IMPOSSIBLE: THAT ANY PERSON COULD SURVIVE FROM THAT EXPLOSION"
YESHAYAHU CH.43:2 "WHEN YOU PASS THROUGH THE WATERS, I WILL BE WITH YOU: AND THROUGH THE RIVERS, THEY SHALL NOT OVERFLOW YOU: WHEN YOU WALK THROUGH THE FIRE, YOU SHALL NOT BE BURNED: NEITHER SHALL THE FLAME KINDLE UPON YOU". 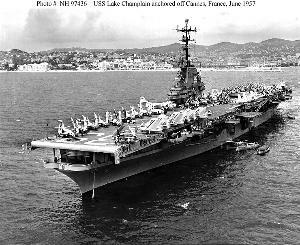 The Aircraft Carrier, the USS Lake Champlain, on which Ken Cantrell was serving was enroute to Italy going 40 knots per hour when the explosion occurred in the Mediterranean Sea off the coast of Gibraltar. At 11:03am on August 7, 1953 at the time of the explosion, Ken Cantrell was in the Catapult Room of the largest Aircraft Carrier in the U.S. Navy. At the time a crew of 16 men were sending off planes every 2½ minutes. Fifteen of the crew were killed instantly, but the 16th crew member, Ken Cantrell, survived. The explosion caused an inferno of death, but Ken Cantrell was protected by the power of the Holy Ghost: “God told me that I should not be afraid, but to open the door and go out. I went in and out, and I carried the burning bodies one by one out of the ‘melting death oven’, while the flesh fell from their bones.” This took approximately 35 minutes. “We were on our way to Italy facing 40 knot winds when it happened. “I was born on June 15, 1932, in Huntsville, Alabama. My father was a night-club owner. The name of the night-club was ‘Bloody Bucket’. It was the most notorious, toughest and bloodiest night-club in the entire state of Alabama. I remember that in one week, 17 people were killed inside the club and in front of it. At the age of 18, a great transformation came over my entire life. My grandfather was a Baptist minister. Although I was one of the worst sinners, I had respect for my grandfather and the Baptist church. I often wondered what it would be like to be a Baptist minister. I gave my heart to the Lord at 18, and I gave up my old ways. I took my Havana cigars out of one pocket and my Tampa cigarettes out of the other pocket. I then took out and threw away my loaded dice from yet another pocket and removed my marked playing cards from still another pocket. I meant business when I accepted the Lord as my Savior. I was determined to serve and follow Him all the way. When I was stationed in San Diego, after I enlisted in the U.S. Navy, a Brother Ratan invited me on the street to `Mother Lane`s Hospitality Home` for the Service Men. Although I was on my way to a Baptist Church, Brother Ratan persuaded me to come to his Service-Men`s Centre. A minister, the Rev. Franklin Hall, through his brother the Rev. Del Hall, had generously donated without charge, a large quantity of his books for gifts to the Service-Men , to the `Hospitality Centre`. I never knew this at the time I attended `Mother Lane`s Centre. At this Centre, Brother Ratan gave me Brother Hall`s book entitled `Because of your Unbelief`, writing my name on the cover, he asked me to read it. He told me that this would enable me to go deeper with the Lord. When I started to read it and saw that it dealt with Fastings of all lengths I decided it was not for me. I thought the author was a little bit off. I however, kept the book with me. On the Aircraft Carrier `Lake Champlain` I tried to read it once again. I then threw it away. Since my name was on it, someone picked it from the trash and brought it back to me. I tore off the cover where my name was on it and tore it up into fine pieces and tossed it into the ocean. I then threw the book into the garbage can. I figured that in the garbage can it would be gone for good and that no one would find it there. Even if they would find it, my name would not be on it. My Commanding Officer loooked in the garbage can and picked it up. What business would a Commanding Officer have looking in a garbage can? He brought it to me and asked if it was my book. I was embarrassed when I informed him that it was mine. For some reason or other, he asked me to be sure to read it first and then if I wished to discard it, i could do so. To this day I did not understand why my Commanding Officer ever looked into a garbage can excepting it to be the Lord who led him to do this. I again tried to get rid of it. Someone found it and placed it under my pillow after bringing it back. It seemed that i just could not get rid of the book. Had I known and realized the vast and tremendous Truth that was contained in the volume - and Truth of such magnitude that because of it, my life was truly miraculously saved, I would have treasured the book as my own soul. The book being returned to me so many times made it seem as though the Lord desired me to really study and read through it. I decided to read it carefully through. Although I had been a Baptist Preacher, I began feeling the Anointing in the pages of Bro. Hall`s book. The more I read, the more interested I became. I decided to try out the Fast. The book was all about Fasting and Faith. It told how a person could go into the long Fasts as well as the short ones. I decided to Fast for 21 days. After reading Franklin Hall’s book about fasting, “Because of Your Unbelief”, I started a 21-day fast (water only). After 3 days, hunger left my body and I felt the presence of the Lord on my body in a way I had never felt before. The Lord gave me the verse in LUKE 10:19, and showed me that nothing would hurt me: "Behold, I give unto you power to tread on serpents and scorpions, and over all the power of the enemy: and nothing shall by any means hurt you." On the tenth day, I felt a warm healing power come over my whole body. Daily, this ‘covering power’ over my body grew stronger and stronger. I had the same experience as the 120 disciples in the upper chamber, in ACTS 2:3: "And there appeared unto them cloven tongues like as of fire, and it sat upon each of them." These tongues of fire also sat upon me. In LUKE 24:49, Jesus said that this would happen. Day by day on my 21 day Fast I could feel this `Holy Ghost` protection increasing all over my body. it had a pleasant, warm feeling to it and kept getting warmer on my body, especially on the 15th and 16th days. The night before the explosion it was so strong on my body I could hardly sleep. My mind was highly alert, active, and I felt stronger in my body than I had ever felt in my life. "I shall not die, but live, and declare the works of the Lord"
11:03 am -Suddenly we heard a noise. Someone above us had made a blunder. An Aircraft came in wrong, damaging the Area near our room. This ignited a fire. High Grade Aviation Gasoline was near the accident and was pouring into our room. It soon ignited and became a huge sheet of billowing flames. Immediately the whole Deck was ablaze with flames all over the Catapult Room. If many of the boys, who had just returned a few seconds earlier, had stayed away for just a moment longer, they would not have been engulfed in the ‘flames of death’. They would not have been in the room. Horror came over their faces. Some tried to run. Many were screaming: “Fire! Fire!” I also yelled out: “Fire!” Huge billows of rolling, raging flames were rushing towards everyone. It moved quickly. We had no time for anything. Great flames engulfed each and everyone of us including myself. It was like lightning. With horror I saw all 15 of my Crew Mates swallowed up in sudden death. Joe and Don were the furthest away from the only door in the room when the explosion occurred and Don fell to the floor with Joe Carnes. Joe Carnes was my best friend. He was heavy-set, crew cut and came from Louisville, Kentucky. When in Norfolk, Virginia, I tried to get him to go to church with me. I talked to him about Jesus. He would not come to church and refused to accept Christ. Joe was sitting next to me at the time of the explosion. He began shrinking in the flames. His head, shrunken so small appeared as a mummy dwarf - others likewise, as I watched their bodies bake to a crisp. I reached over to where Joe had been sitting and placed him on my left arm and partly on my shoulder but his flesh fell from his bones as I held him in my arms. It was not long before I could hear the frying of the flesh from the bodies of my buddies. It just did not seem possible that I could be alive in the Furnace of Fire and my buddies being killed. As the flames of death engulfed my buddies one by one, it seemed that I had supernatural eyesight when I could look through the Flames and see all 15 of my buddies go down in the flames. I then went to my other mate, Don Hatcher. He was a dark-haired young man from Kansas City, Missouri. Don was trained and worked in electronics, and he had assisted me with the P.A. system. I really liked him, but I had not been successful in turning him around to Jesus. I tried and tried, but in vain. I believe that if he had been saved, God would have somehow rescued him from the flames. He did not want to die, and he screamed when the fiery ‘arms of death’ came towards him. Don tried in vain to escape from the deadly fire’s reach, but the flames overcame him. The flames filled the whole of the 10-15 metre long room. If this had not been a supernatural event, I should not have been able to get away. There was a huge wall of this fire at least 30 feet thick. I felt no pain. I was walking back and forth in the flames hardly realizing what to do, not feeling any discomfort or even heat of the fire in any manner. My first thought was not for my own safety, but for my buddies. I still had Brother Hall`s book with me. I laid it down in the fire. It seemed that the Truth of the Lord Jesus in the volume and the way and manner that I was practicing it had brought the Power of the Lord Jesus upon my body that I could not be hurt. While in the fire I tried to pick up the bodies of some of my mates to see if there was any life in them. As I grabbed them, tugging at them, their baked and cooked flesh just fell off their bones. I tried picking up several in this way. I was in the flames for 35 minutes. The floor was getting red hot. The dog wrench over near the hatchway was also red hot. I was struggling with my friend Joe’s corpse. I had carried him back and forth a couple of times in the room of fire. Now as I was facing the hatch, the Voice of the Lord came forth and told me, "Go forward to the red hot hatchway. Be not afraid. Grab the wrench, open the door and walk out." I got closer to the door and hesitated right in the Flaming Inferno. Although flames were around me I did not dare to touch the glowing red hot door. Again the Lord said, "Be not afraid, I am with you, you shall not die, open the door and walk out." I still held the corpse of Joe. I picked up the red hot dog wrench with my right bare hand and used it to open the hatch. I walked out, much to the amazement and bewilderment of the Officers, Chaplain and spectators, and laid down the body of my buddy Joe. I then turned to go back in for the bodies of the rest of my buddies. My Officers ordered me not to but I disobeyed and returned against orders and retrieved, one by one, the corpses of my buddies and brought them out and laid them down. The skulls were shrunken to about one half their size. This was true for each and every one of them. The extreme heat on the bodies and bringing them out into the cool air caused some of their eyeballs to pop out. A sailor tried to follow me into the Catapult Room but his feet were burnt off and he was left with stumps. I was unhurt. My clothes were not even scorched and no smell of smoke. I then remembered that I had left my book in the Fire. I returned for it and retrieved it. The book was untouched and entirely intact just as I had laid it. The cover was off because at first I did not like the book and I had thrown the cover overboard. Right on each side of the book, "Because of your Unbelief" there were ashes. They were all around it. All other books were burned to ashes. The Truth that God had led Brother Hall to put into the book was not burned. The Chaplain of the Ship who had previously refused to allow me to have Prayer Meetings in the Ship almost knelt down at my feet, telling me I could have Prayer Meetings any time at any place. God had shown how He still protects all who truly follow Him. Below : U.S.S. LAKE CHAMPLAIN...AIRCRAFT CARRIER AT TIME OF EXPLOSION. Note in the picture how high the flames were and how the smoke spread up through the flight deck. It took seven months to repair the damage to the Catapult Room. The metal, control valves and maneuver panel were totally melted. Three thousand sailors were witnesses to the explosion and to the Holy Ghost `superman’ who walked through a Wall of Fire at least 30 feet thick for 35 minutes and was completely unhurt, with no smell of smoke on his clothes. "In the mouths of 2 or 3 witnesses every word may be established"
"It is also written in your Torah that the Testimony of 2 men is true"
“I was the First Officer when the accident happened and I saw Ken Cantrell walk through the flames several times. I saw Ken go in and out of the room. He carried out 15 bodies, the whole crew that had been working with him. They were all dead and impossible to recognize. They looked like roasted meat. I tried to stop Ken when he was going in and out of the ‘melting oven’. I tried to stop him outside the door but came too close to the entrance of the room and got burned and had to be treated. The fire did not have any effect on Cantrell’s body. He was like a superman, though he became exhausted in his exertion of carrying out the bodies. I saw the Doctor examine Cantrell after the fire was put out. "I was stationed with Ken Cantrell on the USS Lake Champlain, and was one of many witnesses who saw how Cantrell went through the fire, picking up the dead bodies on which the flesh was so burnt that it fell from the bones. All 15 crewmen died in the fire. “I had watch duty from 8:00pm until midnight in the part of the ship where Cantrell was living. It was approximately 11:00pm on the 6th of August, 1953 - the night before the explosion. Cantrell didn't take part in any meals. I went over to him to say that it was high time to switch off the light. He said to me that he didn't have a light on. I just could not believe it. I went closer to the cabin in which he slept, and could hardly believe what I saw. I saw how light came out of Cantrell's body. I had read about light shining from a man in the Bible, a prophet that had fasted for 40 days. I know that it was this supernatural preserving fire of God that saved Cantrell from being burnt or injured when the flames came over him." "WORST REMEMBERED FIRE ON FLIGHT DECK IN 1953"
" FLIGHT DECK CRASH, INJURIES AND DEATH"
"TERRIBLE FIRE ON FLIGHT DECK"
"SOME CLOSE FRIENDS AND NOT SO CLOSE FRIENDS GETTING KILLED ON FLIGHT DECK". AND READ THE INSPIRING TESTIMONIES AND TEACHINGS ON CONSECRATED FASTS OF UP TO 3 DAYS, 14, 21, AND 40 DAYS!!! AND OF HOW TO SAFELY ENTER, OUTWORK AND CONCLUDE CONSECRATED FASTS !! MUCH OF THE TEACHINGS IN PART 3 ARE DRAWN FROM THE TEACHING MINISTRY OF BROTHER HALL, WHOSE BOOKS ON THE SUBJECT OF THE CONSECRATED FAST ARE SECOND TO NONE!! YOUR HEART AND SOUL WILL SURELY THRILL WITH EXCITMENT AND ANTICIPATION AND PRAISE TO YAHWEH AS YOU READ OF HOW YOU CAN ENTER A CONSECRATED FAST THAT WILL REVOLUTIONISE, ANOINT, STRENGTHEN AND BLESS YOUR LIFE AND MINISTRY FOR YWHW. YOU TOO, AS YOU READ, IMBIBE AND OUTWORK THE TEACHINGS IN PART 3 , CAN EXPERIENCE SUCH A REVOLUTIONISING LIFE-CHANGING EXPERIENCE THAT WILL FOREVER DEEPEN, STRENGTHEN, ENVELOPE AND PERMEATE YOUR WHOLE BEING THAT YOU TRULY WILL NEVER BE THE SAME AGAIN.